Welcome to Weekend Watch, a recurring feature where we highlight some of the best geek-related videos around the web. Whether it’s short films, behind-the-scenes videos, video essays, or top 10 countdowns, the only requirement is that they are about our favorite geeky topics! In this week’s edition of Weekend Watch, we’re taking a look at the ending of Captain Marvel, and what it means for Avengers: Endgame and beyond. We’ll start with an examination of the post credits scenes. Then a pair of videos try to address some of the biggest WTF questions. After that, we’ll take a look at a scene breakdown from Captain Marvel’s directing duo. Finally, we’ll close things out with videos on how Captain Marvel changes the MCU. 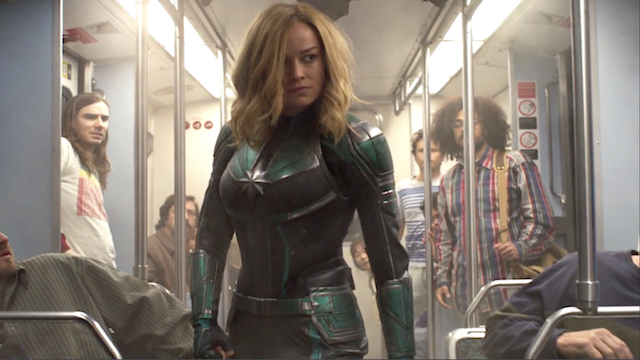 Kicking things off, we have a video from New Rockstars breaks down the post credit scenes in Captain Marvel, along with some potential Avengers: Endgame Easter eggs. It also uses the previous Endgame trailers for context. The video also tries to make sense of how the Tesseract reveal ultimately fits into the timeline. Finally, they raise an interesting point. Carol’s arrival at the Avengers facility may play out differently in the final cut of Endgame. In this video from IGN, takes a look at some important questions that aren’t really answered in the film. Captain Marvel creates some slight continuity disparities, such as how Fury actually lost his eye. The video also wonders whether a Secret Invasion adaptation could still actually happen. Additionally, it asks why Fury didn’t call Carol before the events of the Decimation. There’s also the lingering question of how Mar-Vell got the Tesseract. Speaking of the Tesseract, another IGN video looks at the slightly ambiguous timeline of the space stone. While some found the timeline of the artifact confusing, this video does a good job of streamlining its MCU appearances. Chronologically speaking, the first appearance of the Tesseract was in Captain America: The First Avenger. At the end of that film, it made it’s way to the bottom of ocean. Howard Stark and S.H.I.E.L.D eventually recovered the Tesseract, which the former would study for years afterward. That’s where Captain Marvel’s Project Pegasus comes into play nearly fifty years later. How Mar-Vell actually came into play is still anyone’s guess. Shaking things up a bit, we have a video from Vanity Fair that features the film’s directing duo breaking down the train fight scene. Anna Boden and Ryan Fleck discuss the inspiration and execution of the scene in question. They cite The French Connection’s train chase sequence as the primary inspiration for the feel of the scene. It’s also interesting to note how the duo tried to emulate the look of a ’90S action movie. It’s also great to see that Boden and Fleck give shout outs to the great work from the extras in this scene. That’s something directors rarely do. Up next, we have a video from Top 10 Nerd that looks at the various ways that Captain Marvel affects the MCU. Aside from more obvious things like the Avengers Initiative connection at the end of the movie, there are some interesting ideas here about how Captain Marvel’s presence will expand the cinematic universe in the future. The movie also opens the door for new legacy characters like Monica Rambeau, a.k.a. Photon or Spectrum. Most importantly, the video hones in on how Captain Marvel will burst open the door for more diverse heroes to enter the fold. Finally, this video from Screen Crush takes a look at – as the title implies – every Easter egg and secret in Captain Marvel. Although this video largely focuses on many of the changes form the source material, there are tons of easily missed little details that are also discussed. We also learn about how the film stacks up visually to the other cosmic entries in the MCU such as Guardians of the Galaxy, as well as the additions to the continuity in general. What are your thoughts on the Captain Marvel‘s implications for the MCU? Make sure to let us know in the comment section below!